The Fingask Pavilion is a noted venue for Ceilidhs, and parties. 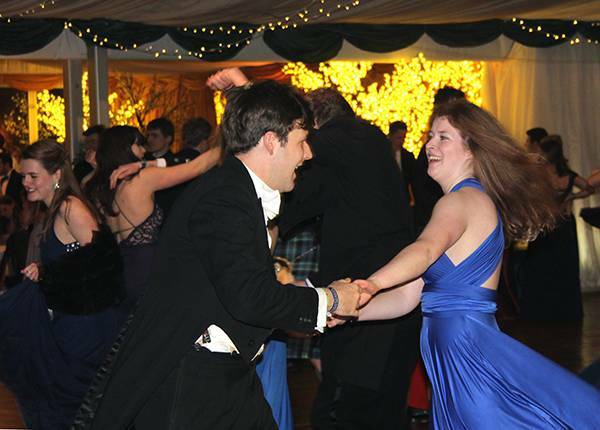 The Perth Ball committee searched Perthshire for a venue with sufficient capacity and atmosphere before choosing Fingask to continue their 160 year old tradition of holding the most prestigious Reeling Ball in Scotland. We pride ourselves on being flexible so Fingask is also known for holding School parties (Proms), 21st Birthday parties, 40th Birthday parties, and 90th birthday parties. Guests are welcome to spill out of the pavilion and wander around the topiary garden, for which Fingask is famous. The best caterers in Scotland can be found on our list of recommended caterers. Cheap and cheerful BBQ’s are also welcome! The pavilion can host parties of up to 200 people as it stands, but for reeling – which takes up a lot of space - we put on an extension and the place throbs and looks splendid with 25 eightsomes going at the same time!